One of the highlights of visiting Italy is undoubtedly the food. Quite often, armchair travelers think of the main entrée when ruminating on Italian cuisine: delicate pasta, red wine and fresh bread. However, Italy is also known for sweet, indulgent desserts. There are often many misconceptions about this well-known ice cream alternative. If you’re curious about what to look for, here is some information I hope you find helpful. As an added benefit, when you book travel with WrightStone Custom Travel, food tours (including gelato) can be included as part of your vacation to the best cities to visit in Italy. Shockingly, gelato has a history that is hard to verify. There is little evidence to corroborate a lot of the “facts” about gelato. Some people believe this frozen dessert was invented by people in living in Sicily, ancient Rome and Egypt — they would bring snow and ice from the summits of mountains and preserve it underground. The gelato we know today seems to have evolved during the Renaissance period and involved the Medici family of Florence. In the early 1500’s, The Medici family sponsored a contest looking for the best frozen dessert. The winner had created a concoction of ice and fruit juice which we would consider sorbet. During the mid to late 1500’s, the Medici family commissioned Bernardo Buontalenti to create a dessert to serve to the King of Spain. Bernardo Buontalenti is considered the creator of gelato. The first machine invented for mixing the ingredients in this dessert is credited to a Sicilian fisherman named Francesco Procopio dei Coltelli. The cart to serve this treat was originally used in Varese, a northern city in Italy sometime in the 1920s and 1930s. The word gelato is derived from the Latin word “gelatus” (meaning frozen). In Italy, this term incorporates not only ice cream but also includes anything from yogurt to custard. Gelato is not the same as ice cream and is, in fact, substantially more dense than ice cream. However, that density doesn’t compromise the flavor at all! Gelato’s unique elastic and fluid nature make it a silky smooth Italian alternative to the traditional American frozen treat. There are 3 additional differentiating factors that ensure authentic gelato is completely different than ice cream. Gelato and ice cream share many similar ingredients: cream, milk sugar. Cream is essential for the creation of ice cream. On the other hand, gelato recipes typically demand more milk than cream. Curiously, gelato normally contains no egg yolks. Ice cream utilizes egg yolks to pack the ingredients together into a satisfying mix. In rare instances, gelato may contain slight amounts of egg, but they only are included to add flavor. Since there is more cream in ice cream this leads to an increase in butterfat. Butterfat not only helps ice cream stay delicious, but ensures the ice cream is thick, heavy, and firm. However, gelato is often a softer mass. Some purists argue that the lower butterfat content increases flavor too. Butterfat can supposedly coat your palate, meaning that less of it can enhance the flavors of a supreme dessert. Habitually, ice cream is churned with up to 50% air. With the decrease in butterfat, gelato is already light. However, gelato also only needs 20 to 30 percent air to thicken and freeze. Hence, gelato is dense and therefore creamy. In other words, gelato is churned with less air ensuring a creamy texture. 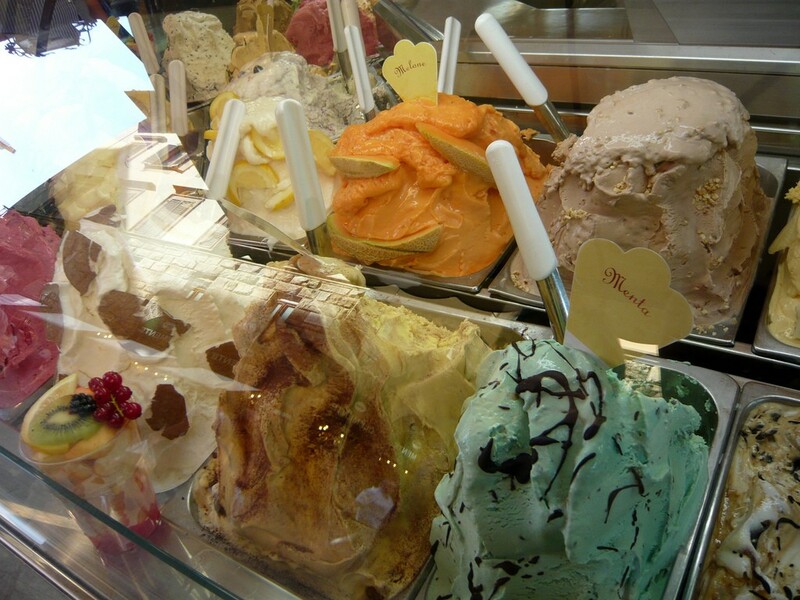 Authentic Italian gelato is generally served at 7 to 12 degrees Fahrenheit. This is warmer than the 5 degree Fahrenheit recommend serving temperate of ice cream. Interestingly, cold can numb your tongue and taste buds so the flavor can be decreased. 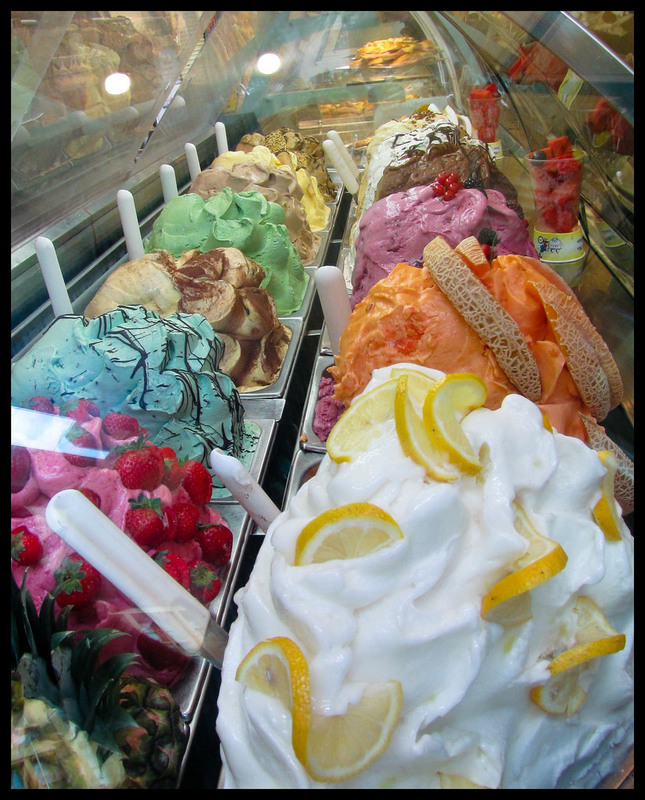 Since gelato is warmer when it is served, there is naturally more sweet intensity to the taste. When choosing a gelateria in Italy, look for terms like gelato fatto en casa indicating that what you are about to eat is “homemade”, while produzione propia means “our own production.” Beware that while beautifully colored gelato may look enticing, this could actually indicate the presence of food coloring. Looking for more natural colors indicates that the ingredients used are bona fide. Here at WrightStone, my favorite flavors of gelato are chocolate, banana & hazelnut. In Italy, hazelnut or nocciola, is the #3 flavor after chocolate and crema. Following are some of the more interesting and classic flavors, but there are hundreds more! Bacio is a classic. Milk chocolate, hazelnuts and dark chocolate. This exotic recipe has a nutty flavor, owing to the black sesame seeds within. Comforting and warming, this cinnamon taste is surely a delight. Crema is Italian Custard. Simple. Satisfying. Pairs well with other flavors. A classic made with vanilla beans. Ready to try the real thing, also known as the “best ice cream ever?” Let WrightStone Custom Travel help plan your trip to the birthplace of gelato. We specialize in affordable vacations to Italy that are customized to you. I invite you to contact me today. I look forward to speaking with you.